Ants bother people a lot, but few species do any real damage. Here’s a rundown on the most common ants and related controls. First - some general guidelines on ant control. Do some research and identify what ant species you are dealing with. Each species has different habits and locating their food, water and shelter will determine your success. Watch the activities of the ants to find where they are coming and going. If you find how they are entering your home, you can physically exclude them. Remove or alter the conditions that invited them in the first place. Keep counters clean of food. Try to keep sinks and surrounding areas dry. Wiping counters down with vinegar or citrus oil can work as a temporary deterrent as well as increase the cleaning power. If steps 1 - 3 do not slow the ants down, it is time for baits, dusts or sprays. Remember that you are only seeing a small portion of the colony at any one time. Only about 10% of a colony will forage outside the nest. Therefore baits are often the most effective approach. Applying any insecticide organic or chemical will not work to solve an ant infestation in the long run. It could cause the colony to bud or split into multiple colonies creating more problems. Properly made baits are highly attractive to ants and under most conditions provide good control. Place baits into spill proof containers out of the reach of children and pets. The stations will need to be placed along active ant trails. It is important to remember that boric acid contains elemental boron and at high concentrations will sterilize soil. This process is slow and requires monitoring and refilling of the bait stations. Ants have a habit of changing food sources from sugars to carbohydrates. It may become necessary to mix peanut butter with boric acid to supply both forms of bait to keep the ants feeding on the boric acid. There are ant baits with the active ingredient abamectin. These baits can provide good control and should be used for heavy infestations or when other bait is not effective. They can be applied in stations around foraging ants or broadcast around ant trails. Again, boric can be damaging to the soil. If the homemade baits fail or if you’re not the “home brew” type, hiring a professional pest control company would be the next step. Be sure to find one that understands the non-toxic approach. Remove food and water sources and keep house squeaky clean. Treat ants in the house by cleaning all problem surfaces with vinegar and water, spray visible ants with orange oil at 2 ounces per gallon of water or 1 tablespoon per quart, and dust the worst areas with boric acid, baking soda and natural diatomaceous earth. 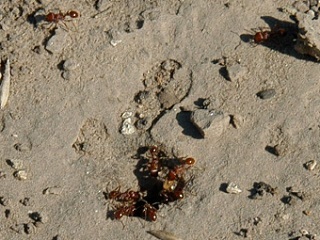 Ants will not cross a DE barrier in dry-weather conditions. Use boric acid baits and plant oil products. Make a solution of 1 percent boric acid (available at any drugstore) and 20 percent sugar by thoroughly dissolving 1 teaspoon of boric acid and 6 tablespoons of sugar in 2 cups of water. Use a clear jar so you can see when all the boric acid crystals are dissolved. Soak cotton balls in this bait solution. Make bait dispensers out of old plastic containers with lids with holes punched in them so the ants can get inside. Put the soaked cotton balls into the containers and close with lids so the bait won’t dry out. Place the bait containers wherever you see ant, in or outside the house. Clean the containers and use fresh bait solution at least once a week. The key is to get worker ants to carry low doses of boric acid back to feed the colonies. Boric acid is mildly repellent to ants, and using a very low dose makes it more likely that surviving ants will continue eating the bait and taking it back to the nests. Keep boric acid and all other baits out of the reach of pets and children. For serious problems, use Abamectin baits. Baby talc, a very soft mineral, basically magnesium silicate (not baby powder with corn starch) is more available than DE, smells good, is non-toxic, matches white window sills better, comes in a handy dispenser and best of all it works! I had sugar ants in my kitchen and a friend advised me to use baby talc in the windowsill. I was surprised that even my mom and dad had never heard of it. In an ant invasion emergency, even the more expensive body talcs can be used if you don't have DE or baby talc on hand. The Rasberry crazy ant or tawny crazy ant, Nylanderia fulva, is relatively new for us and originally from South America. Like the longhorn crazy ant (Paratrechina longicornis), this species is called "crazy ant" because of the ants' quick, erratic movements. It is also called the "Rasberry crazy ant" in Texas after the exterminator Tom Rasberry, who noticed the ants were increasing in numbers in 2002. In 2014, it was discovered that this ant produces and covers itself with formic acid as an antidote against the fire ant's venom. It is the first example of an insect being able to neutralize another insect's poison, an ability speculated to have evolved in South America while sharing the same native range. Colonies have multiple queens, which contributes to their survival. These ants don’t sting but can be damaging to electrical equipment that they are attracted to. The good news is that they are relatively easy to control with dustings of natural diatomaceous earth. The ant’s fast movement make the DE quite effective.